Welcome to my homepage, dedicated to my Warhammer 40,000 armies and other hobby activities. I began this site to track my progress on my biggest 40k project, a Napoleonic Imperial Guard army - the 68th Praetorians - The Durham Light Infantry, a 'role-play' army project for Warhammer 40,000. However, it has now grown to cover my Space Hulk terrain project, my Space Marine, Tyranid and Classic Genestealer armies as well! For the latest information, see the Blog. The inspiration for the 68th Praetorians project is my interest in the Napoleonic wars, and particually the role played by the 68th Durham Regiment of Light Infantry. 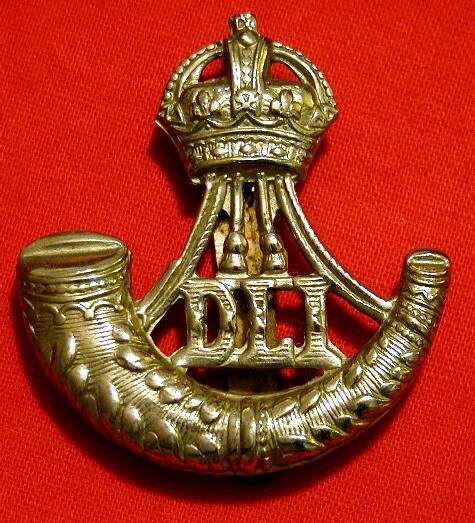 This year is the bicentenary of the regiment's conversion to a Light Infantry regiment in 1808, and the 40th anniversary of it's eventual 'dispansion' into a TA regiment in 1968. On this site, I will log my progress, my ideas, instructions detailing how I'll go about converting the miniatures, and all manor of other things that come to mind. The big project will be the army; turning the Victorian Praetorians into Napoleonic Durhams will not be easy! Along side this, I aim to build a modular, four part terrain piece; a 40k version of Hougamont, the farm that the Battle of Warterloo raged around. There's some other ideas for terrain as well; bell tents, gunnery emplacements, a long ridge (the preferred occupation point of the Line). "We are the Durhams! What are we?" The cry of the 68th. "Everywhere Private Green looked, orks were charging across the field. The brutal xenos were running around wildly, firing their weapons off apparently at random, swinging large, rusty axes at the heads of any guardsman they happened to be near. There seemed no rhyme or reason to the insane charge of the orks, and yet the skirmish line was being steadily pushed back. The Light Infantrymen were falling back in ordered lines; the front rank would fire and then fall back a dozen paces, weaving between the covering rear rank as they slammed fresh charge packs into their 'Brown Bess' pattern lasguns, before turning to cover the retreat of their file partners. The orks, wild in their desire to kill and drunk with apparent success, came on heedlessly. One of the brutes came at Green as he stood to make his retreat, only to fall in a roar of pain and anger as las fire cut into his torso and face. As Green neared Gregor, his file partner, a passing glance was enough to convey his deepest thanks! Just before he turned to cover Gregors own retreat, a loud, clear blast echoed over the field; the clear ringing of a vox-bugle. Green, along with every member of the 68th Praetorian, knew that signal by heart and cheered as a line of red marched in perfect discipline over the crest of the ridge the skirmishers were retreating towards. The orks roared in suprise and joy at the sight of fresh troops to fight, and charged towards the newcomers. Without the need for orders, the Light Infantry were closing to the left and right of the line, opening a wide corridor of fire into which the orks barrelled unthinkingly. As Green ran, he glanced back in time to see the thin red line present their lasguns, and fire." This work is completely unofficial and in no way endorsed by Games Workshop Ltd, the MOD or DLI. 40K, Adeptus Astartes, Blood Angels, Cadian, Catachan, Chaos, The Chaos device, the Chaos logo, citadel, the citadel device, city fight, codex, Daemonhunters, Dark Angels, Dark Eldar, Dark Future, Dawn of War, The Double Headed/Imperial Eagle device, Eldar, Eldar, eldar symbol device, Eye of Terror, Fanatic, the Fanatic logo, the Fanatic II logo, Fire Warrior, the Fire Warrior logo, Games Workshop, the Games Workshop logo, Genestealer, GW, Inquisitor, the Inquisitor logo, the Inquisitor device, Khorne, the Khorne logo, Kroot, Lord of Change, Necromunda, Necromunda stencil logo, Necromunda plate logo, Necron, Nurgle, the Nurgle logo, Ork, Ork skull devices, Sisters of Battle, Slaanesh, the Slaanesh logo, Space Hulk, the Space Hulk logo, Space Marine, Space Marine Chapters, Space Marine chapter logos, Tau, the Tau caste designations, Tyranid, Tyrannid, Tzeench, the Tzeench logo, Ultramarines, Warhammer, Warhammer 40k device, Warhammer 40,000, and all associated marks, races, race insignia, characters, vehicles, locations, units, illustrations and images from the Warhammer 40,000 universe are either ®, TM and/or © Copyright Games Workshop Ltd 2000-2006, variably registered in the UK and other countries around the world. Used without permission. No challenge to their status intended. All Rights Reserved to their respective owners.